Since its creation in 1958, the U.S. National Aeronautics and Space Administration (NASA) has been studying Earth and its changing environment by observing the atmosphere, oceans, land, ice, and snow, and their influence on climate and weather. As astronaut Sally K. Ride, the first American woman in space, was leaving NASA in 1987, she suggested a Mission to Planet Earth to preserve our planet through coordinated research into Earth's global environment. Exploring how Earth's systems of land, water, air, and life interact with each leads to better understanding of the global environment. Earth science blends research in the fields of study that deal with Earth and its parts, such as oceanography, meteorology, atmospheric science, and biology. Following Ride's proposal, NASA planned a series of satellites known as the Earth Observing System (EOS) as the nucleus of a "Mission to Planet Earth." From high above Earth, EOS satellites would monitor land, sea and atmosphere for changes in the environment. In 1991, NASA upgraded the project to a more comprehensive program studying Earth as an environmental system. The space agency refers to it as the Earth Science Enterprise (ESE). By using satellites to examine Earth thoroughly, ESE expands human understanding of how natural processes affect human beings, and how human beings affect natural processes. Research scours such diverse resources as land surfaces; the waters, oceans, glaciers, and polar ice sheets; atmospheric chemistry and processes, and clouds; energy cycles; and ecosystem processes. Such research improves many things, including weather forecasts, predictions of climate changes, agricultural and forest management, and planning by diverse users such as fishermen and local governments. teams of scientists to interpret the data. The early science results from the ESE came from a variety of small satellites, as well as space shuttle missions, and aircraft flights. Today, EOS is the centerpiece of NASA's Earth Science Enterprise. To help us understand Earth as an integrated system, EOS maintains a series of polar-orbiting and low inclination science satellites for long-term global observations of the land surface, biosphere, atmosphere, and oceans. EOS is the first observing system to integrate measurements of Earth's processes. Terra, the first Earth Observing System satellite, was launched aboard an Atlas-Centaur IIAS expendable rocket from Vandenberg Air Force Base, California, at 1:57 p.m. EST on December 18, 1999. Aqua (formerly EOS PM-1), the second EOS satellite, was launched aboard a Delta II expendable rocket from Vandenberg Air Force Base, California, at 5:55 a.m. EDT on May 4, 2002. Aqua is studying EarthÕs water cycle with an imaging spectrometer, two radiometers and infrared and microwave sounders. Aura (formerly EOS Chem), the third EOS satellite, was launched aboard a Delta II expendable rocket from Vandenberg Air Force Base, California, at 6:01 a.m. EDT on July 15, 2004. It s sounders measure air quality, stratospheric ozone and climate change. PARASOL (Polarization & Anisotropy of Reflectances for Atmospheric Sciences coupled with Observations from a Lidar) was launched aboard an Ariane 5 at 1626 GMT on December 18, 2004, from the European Space Agency's (ESA) launch complex ELA3 at Guiana Space Center at Kourou, French Guiana. PARASOL is a project of the French space agency Centre National d'Etudes Spatiales (CNES). Its radiometer studies the atmosphere by measuring the direction and polarization of light reflected by clouds and aerosols. CloudSat and CALIPSO were launched together aboard a Delta II expendable rocket from Vandenberg Air Force Base, California, in July 2005. 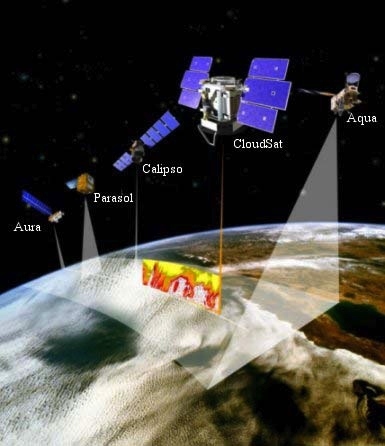 CloudSat and CALIPSO complement each other in providing a 3-D view of clouds and aerosols showing how they form, evolve, and affect weather and climate. CloudSat is a U.S.-Canadian project using radar to measure thick ice and water in clouds. CALIPSO (Cloud-Aerosol Lidar and Infrared Pathfinder Satellite Observations), a U.S.-French mission, has a lidar and infrared and visible imagers to measure thin clouds and aerosols over the globe. The so-called A-Train is a flotilla composed of the Aqua, Aura, CloudSat, PARASOL and CALIPSO satellites flying in formation in low polar orbits 438 miles (705 km) above Earth at an inclination of 98 degrees. Together, their overlapping science instruments give a comprehensive picture of Earth weather and climate. The satellites are referred to as the A-Train because the caravan has been said to resemble a train of satellites flying around Earth. The A-Train reference comes from a jazz tune, Take the 'A' Train, about riding a subway to New York City's Harlem, written in 1941 by Billy Strayhorn and made famous by jazz maestro Duke Ellington. However, the railroad metaphor doesn't give an accurate picture. The satellites do not follow each other in single file. Rather, they fly independently and cross over the equator a few minutes apart starting just after 1:30 p.m. local time. The A in A-Train also stands for "afternoon" because the satellites cross the equator shortly after noon. Aqua leads the train. It is the largest satellite in the group and the first to cross the equator each day (about 1:40 p.m. on ascending passes) and night (at 1:40 a.m. on descending passes). The spacecraft travel around the planet at more than 15,000 mph. Ground controllers maintain their orbits within 15 minutes of the leading and trailing satellites. CloudSat and CALIPSO fly within 15 seconds of each other, so they can measure the same clouds at the same time. NASA's Orbiting Carbon Observatory will join the A-Train in 2008. OCO will be placed 15 minutes ahead of Aqua and will measure the concentration of carbon dioxide in the atmosphere. The EOS Project Science Office (EOSPSO) makes its scientific information and resources available to scientists and the general public. NASA has combined its Earth science and space science programs into an integrated Science Mission Directorate. The directorate is involved in NASA's Vision for Space Exploration through its support of scientific exploration activities.